Get ready Browns fans, Hue Jackson just might start calling plays for the Brown and Orange. For the fourth time in seven games in 2018, the Browns were on the short end of the stick, losing their second overtime road game of the season, falling 26-23 to the Buccaneers in Tampa. The talk of the postgame was (once again) head coach Hue Jackson, and not only his job security for a team that has been in every game but won yet has only won two, but the play-calling on the offense side of the ball. 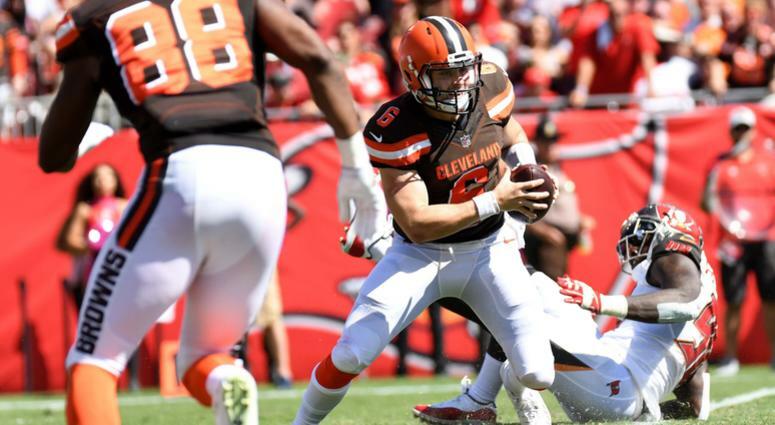 The Browns were dominated in the first half, falling behind 16-2 and 23-9 before rallying in the fourth quarter to tie the game, and then in overtime they did nothing on offense to inspire, with penalties and no real big plays of note before a special teams turnover led to the final Bucs field goal for the win. This after a turnover put the team in Bucs territory in overtime. Jackson and first-year offensive coordinator Todd Haley appear to have never seen eye to eye, dating back to episodes of ‘Hard Knocks’ during the summer. Now after another effort in which the offensive game plan was in question, Jackson says HE may have to step in and do something to get the offense going. “I’ll do whatever I need to do” to get this offense going,” Jackson said after the game. The notion that Jackson is going to start calling plays is a nightmare already for a Browns team that has not looked the same after their big day on offense against the Raiders. They scored 12 against the Ravens in an overtime win, then tanked it against the Chargers losing 38-14, and then against the Bucs scrambled with again the help of four turnovers, but could not convert after an overtime turnover to win the game. It will be an interesting week in Berea to say the least as the team gets set to play in Pittsburgh next Sunday.